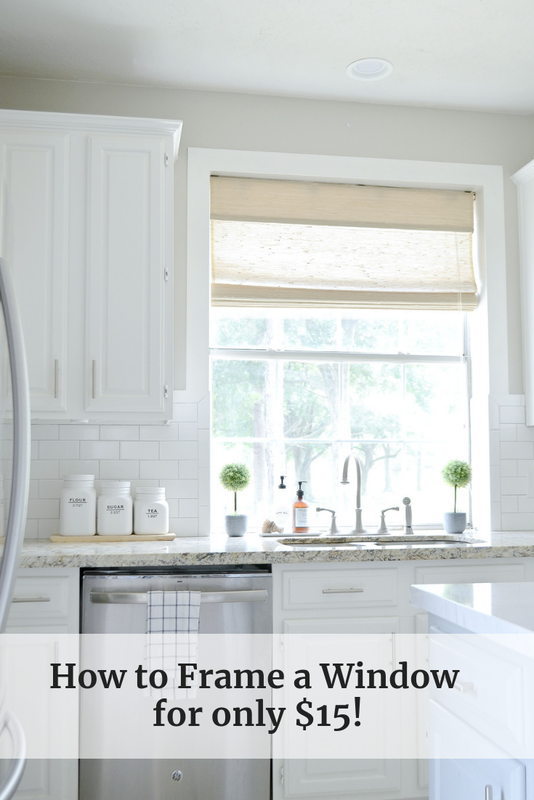 I'm excited to share with you my first DIY project of the year: How to Frame a Kitchen Window. We actually completed this project last year, but with the hustle and bustle of the holidays, I'm just now getting around to blogging about it, because, you know, life. Framing out your kitchen window (or any window) is a super easy DIY to tackle, even for beginners. We had all supplies we needed on hand except for the poplar boards, so we were able to complete this project for only around $15! Even if you had to buy some extra supplies (paint, nails, sandpaper), this is still an incredibly inexpensive DIY to tackle. About this time last year, we replaced the backsplash as part of our Mini Kitchen Makeover. Everything was all ready to go. Except. Except, I happened to be invited on an impromptu awesome girls weekend in Dallas. I couldn't say no. But, the tile guys were already coming the Saturday I was going to be gone on my fun weekend getaway. No problem, right? My husband was home. He could totally handle it. Well, handle it he did. And not in a bad way, either. I came home to a beautiful kitchen with a gorgeous new white subway tile backsplash. (See it in all it's white beautiful subway tile glory-ness below). After I got home and looked at it and thought about it, I instantly had one regret. I hadn't framed out the kitchen window with 1 x 4s before the tile guys came. To be honest, I hadn't really thought about it beforehand. I had my head filled with all sorts of fun girls-weekend nonsense. Truth be told, had I been home when they started laying the tile, I would have caught it. But, I didn't. Because I wasn't there. I can just frame the window out now. Right? Only problem is that a 1x4 would be wayyy too thick to sit atop the tile that wraps around the window. It would just stick out. And look ridiculous. I knew I had to have a pretty slender piece of wood that wouldn't look ridiculous and overhang the backsplash. So, off to Home Depot I went in search of something--anything--that might help me frame this window out. I had an idea of something that might be pretty perfect, and headed straight to the lumber section for poplar boards. And wouldn't ya know? I was right! 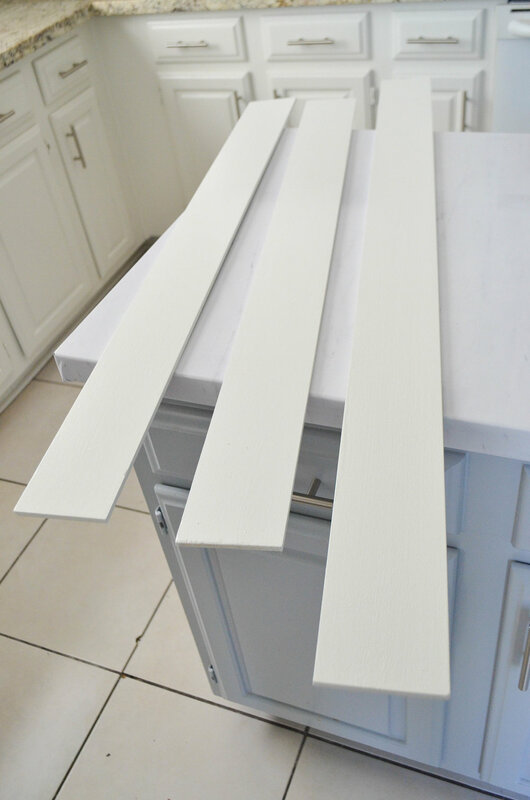 I've used these poplar boards for so many projects--including my World's Easiest Foolproof DIY Banner Signs and for board and batten in my hallway (post coming soon!) --and I knew they just might work. I quickly bought a couple of boards and got home to get to work. Here's a shot of the poplar boards after I cooked this idea up in my head. I just taped them up there to get a feel for whether I'd like it. And to be honest, I really kind of like the raw wood look of the boards before they were painted. But in the end, I decided to paint them, and go for some color and texture in the form of some woven shades instead. So, here's how I did it. Poplar Boards (or 1x4s if you don't have a window with a backsplash halfway up it to contend with like I did). I used boards that were .25 inch thick, 48 inches long, and 3.5 inches wide). I used these HERE. Miter saw (if you don't have this, you can use a hand saw or a circular saw. You just need to be able to make straight cuts). After I measured and cut the boards for the sides, I wrote on the back which board was for the left and which was for the right. Good to do in case your window isn't perfectly level. They never are. My husband cut these boards using our miter saw, but if you don't have one, you can use a circular saw or a regular old hand saw. You just need to be able to make a few straight cuts. Sand each board using a fine-grit (180-220) sandpaper. Using a damp rag, wipe down each board to remove any dust leftover from sanding, and let the boards dry. Now, you're ready to paint. I used paint leftover from when we painted our kitchen cabinets, since the window frame was going to be so close to cabinets on both sides, I wanted a cohesive look. After you give a coat of paint, allow the paint to dry, and give a second coat. We sanded the boards lightly again before giving them a second coat. Here are the boards after they've been painted, and are ready to hang. Using a simple hammer, nail the boards into place. We used two nails per board. We also put the sides up first, so we could make sure the top was level with both ends. You can see in the pic below how the board sits perfectly on the tile below it. Score! You can also see how, when we measured the boards, we made the sides longer. That's what I was referring to above, when I said add the width of your board to the length of your sides. Hope that makes sense! After the boards were nailed up, hubs used another nail to "set" the nails in the board, so the nails would sink in lower than the surface of the board. He just used a nail, put it on top of the nail that was in the board, and used his hammer to sink the nail in lower. I hope that makes sense. Using lightweight spackling, we filled in the holes where the nails were. We also spackled the seams between the boards, and where the boards met the tile backsplash. You can see the seams before the spackling below. It's starting to look good!! Then, we used a putty knife to smooth out the spackling. Finally, we lightly sanded the whole boards and gave them one last coat of paint to hide the nails, and we were done! Here she is, patiently awaiting her new woven shades. And here's a peek at her all dressed up with her new woven shades. And here's a full-on view because I just can't help myself. So what do you think? Is this a project you think you could tackle? If you like what you see, don't forget to Pin it for later! Also, I'd love to connect with you on Pinterest! You can catch me on Pinterest HERE. 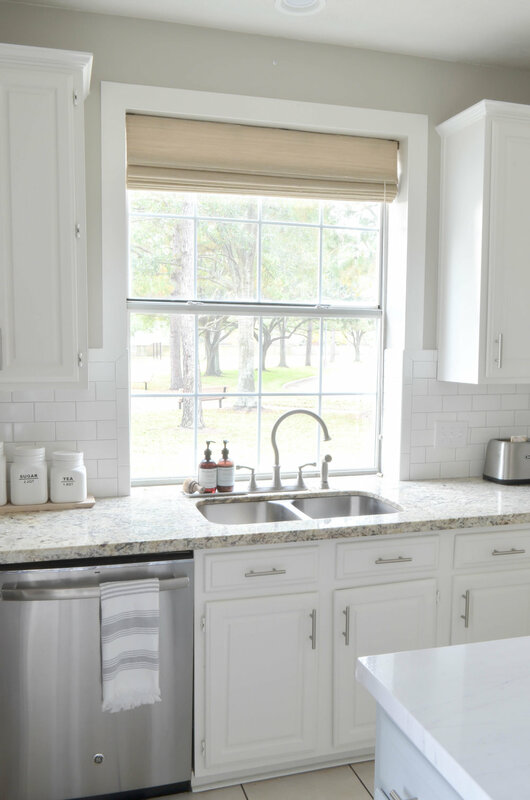 If you want to see how this kitchen has progressed from a standard builder-grade, orangey-oak hot mess, see my post HERE. With Christmas behind us and the new year upon us, it's time to start thinking about goals for 2018. I'm personally kind of a goal lover. Like a true goal freak. If anything ever consistently makes me cry--it's seeing someone meet her goals. I'm always working on at least a few goals at any one time. But, at this time of year, more than any, I love to set a few goals. So, I thought I'd take a minute and write down my House Goals for 2018. Come see what I'm going to attempt to accomplish this year!